If you are a lab supplier interested in attending life science marketing events Arizona where you can meet researchers and learn more about markets that have a wealth of life science funding, Biotechnology Calendar, Inc.’s University of Arizona event may be for you. We will be hosting our annual Tucson BioResearch Product Faire™ Event on October 9th, 2013 on the University of Arizona campus. Biotechnology Calendar, Inc. events are popular with both researchers and exhibitors because we provide a comfortable atmosphere to discuss the latest life science equipment and research news. Not only are our events great for marketing laboratory products and networking with others in the life science field, but they are a great way to learn more about your company’s customer base. Biotechnology Calendar, Inc. events provide the opportunity to make researchers think about who they are buying their lab supplies from. Perhaps a researcher at the University of Arizona purchases their lab needs from a competitor. By exhibiting at our Tucson event, you can bring attention to the fact that your products are more attractively priced, higher quality, time-saving or better for the environment. These are facts researchers will want to know when thinking about whether to continue their relationship with another lab supplier. Biotechnology Calendar, Inc. life science marketing events help researchers to think more in depth about their lab supply needs, and by being at an event in person to meet researchers, sales reps can represent their company in a positive light. Researchers will have the opportunity to gain a better understanding about how they can save money or time in the lab with your company’s products, and thus be more productive. Lab suppliers working to meet researchers with a great deal of available life science funding will find that the University of Arizona is a very well-funded market. The NIH awarded the University of Arizona $83.3 million in life science research funding in 2012, while the NSF awarded the University of Arizona $51.5 million that same year. For more life science funding information on the University of Arizona, including the specific life science funding totals for various life science departments, visit our company blog article Increase Lab Sales Leads at Arizona Life Science Marketing Events. 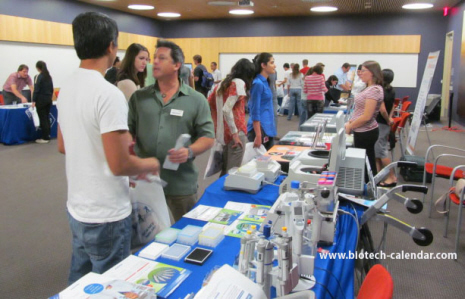 If you are a lab supplier interested in working to meet researchers at Arizona life science marketing events, Biotechnology Calendar, Inc. invites you to attend our Tucson BioResearch Product Faire™ Event on October 9th, 2013. Last year, the Tucson BioResearch Product Faire™ Event attracted 151 attendees. Twenty-five of those attending were purchasing agents, professors and post docs, and 25 were lab managers. The attendees came from 23 different research buildings and 41 departments around campus. Biotechnology Calendar, Inc. is a full-service science research marketing and events-planning company that has been organizing life science marketing events at top research universities across the country for 20 years. If you’re interested in working to meet researchers at life science marketing events closer to home, we encourage you to view our 2013 calendar of events. For more information on the Tucson BioResearch Product Faire™ Event, or for more detailed life science funding statistics at the University of Arizona, Tucson, click on the button below.